As a young girl Morgan's life is torn apart. The father she loves is killed in battle with the High King and her mother is taken away as a spoil of war. She and her sister, Morgause, are left in the care of their elderly nurse, under the constant "protection" of one of Uther's trusted generals. They're allowed to live a semi-normal life, that is until Uther dies and the land in thrown into the chaos of civil war. Knowing that the girls could be used as pawns by any number of men looking to make a grab for power, their nurse secrets them away in the middle of the night, determined to raise them, safely, into adulthood. But, along the way, Morgan will have to face the power growing inside of her and what that will mean in the end. Can she learn to control her impulses, or will she fail, giving into the dark fate that seems so hard to escape? 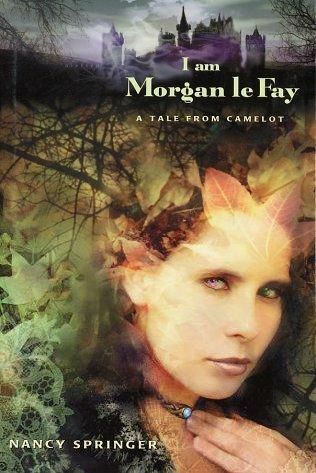 Morgan may not be my most hated character in the Arthurian legend - if I had to name one it would be Lancelot, for betraying his best friend by sleeping with the man's wife. And he was supposed to be good and decent? - but she seems to be one of the harder to write characters, which often leads me to not liking her in a particular book or series. It's sad, really, because I think she has a lot of potential to be a really interesting character. I mean, is she good or bad? Villain or victim? Somewhere in between? This book, while not awful, is just kind of blah. The plot is kind of fractured. There are long stretches where it seems like nothing is happening at all. And it's not even a 250 page book! Of course there's the fantastical element which I always find out of place in the Arthurian legend no matter how much of it is so intrinsically a part of the legend itself. I just would prefer more history and less fantasy, as a whole. I mean, I can accept visions, druidic natural wisdom but magic glowing stones with lightening power? Pixies? Psychic calls? Plus, it just ends up feeling like weak storytelling. I mean, Igraine sleeps with Uther because he's been spelled to look like her husband. Fine, sure. I just find it's more complex, more layered without the magic. Love, lust, power. It would have given her character some actual depth. I also didn't particularly care for the ending. Morgan's complete turn around in the last pages comes out of nowhere. Overall, just a bland, bland book.